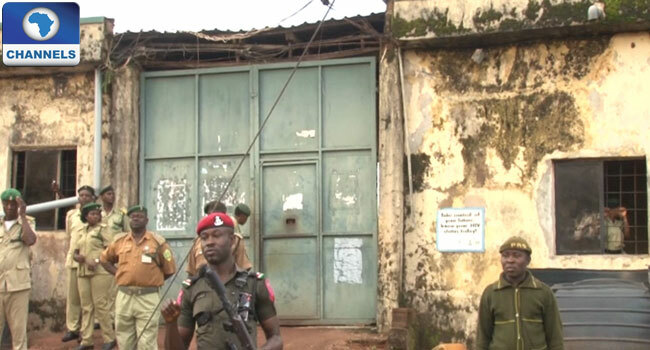 The Nigeria Prisons Service has confirmed a jailbreak at Minna Maximum Security Prison. The spokesperson of the prison service in Niger State, Rabiu Shuaibu, said the incident occurred on Sunday night at the prison, which is in Tunga area of Minna Metropolis. Two persons, a prison warder and a commercial motorcyclist, were killed in the process of the jailbreak. “The unfortunate incident was perpetrated by armed criminals who attacked the prison and gained access after an exchange of fire with armed prison officials. “This led to the death of a prison officer and an Okada rider (commercial motorcyclist) who conveyed a prison officer on night duty,” Shuaibu said. The spokesperson added that the number of prisoners on the run is still being compiled but some of the fleeing prisoners have been rearrested. The prison service has since called on residents of the area to go about their normal activities noting that normalcy has returned and security agencies are working to ensure that fleeing inmates are recaptured. Niger State Governor Abubakar Bello has however visited the Minna Minimum Prison on Monday morning to access the situation. However, the Minister of Interior, Abdulrahman Dambazau after his visit to the prison facility confirmed that 210 inmates escaped from the Minna Maximum Prisons in Niger State. Dambazau told journalists on Monday that over 35 inmates who fled have, however, been rearrested.